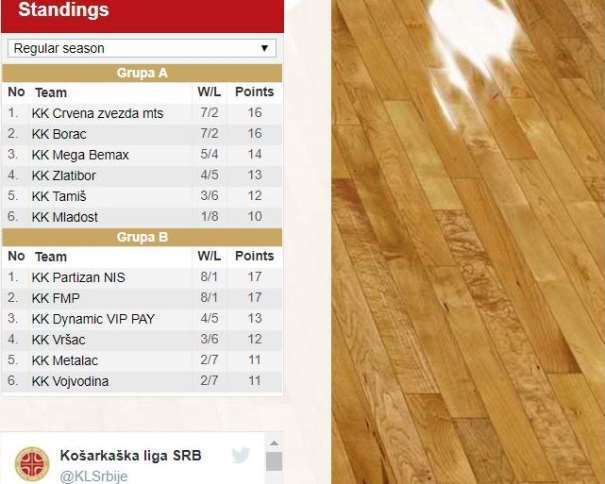 Three teams had more than 100 points in the Group B in the round 9 of the Serbian “Super liga”: Partizan, Vojvodina and Metalac (but Metalac didn’t win the game). 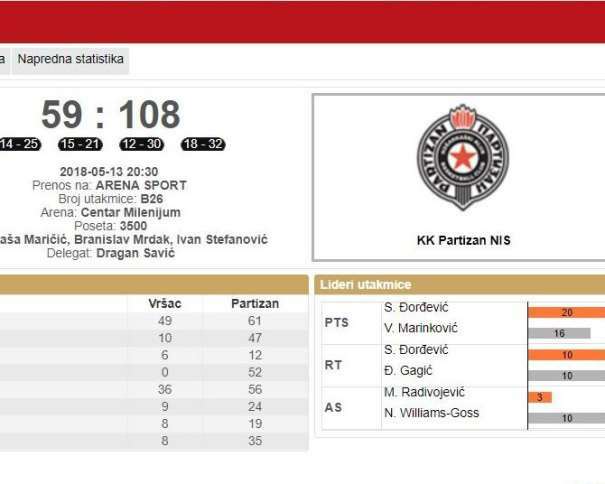 Partizan was better than Vršac with a score of 59 – 108, Vojvodina won 101 – 102 against Metalac and FMP scored 82 against Dynamic (70 points). 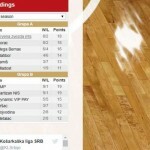 After 9 rounds Partizan and FMP had only one loss and both of them lost against each other. Once again, 100 points are normal occurrence in the Serbian League and one of the three clubs that count over 100 was Partizan NIS. The Black and Whites were better than Vršac. The Final result of that duel was 59 – 108. 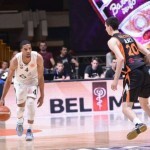 The best scorer in Nenad Čanak’s squad was Vanja Marinković with 16 points, while Nigel Williams-Goss had 16 and 10 assists. Amida Brimah added 14; Đorđe Gagić, 12 with 10 rebounds; and Mihajlo Andrić finished the game with 11. Three players had more than 10 points in Vršac. Stefan Đorđević scored 20; Stefan Momirov, 14; and Stefan Mitrović, 10. The other two teams that score over 100 points were Vojvodina and Metalac and it all happened in the match they played against each other. The winner was decided after two overtimes. The team from Novi Sad celebrated at the end. The score was 101 – 102. Dragan Marojević scored the last and winning point for his team and it was from the free throw line. He missed the first but the second was into the basket. An interesting fact was that Metalac had 62 rebounds, while Vojvodina was stopped at 57. The best scorer for the winning squad was Aleksa Zarić with 22 points. He also had 10 rebounds. Dejan Janjić had two points less, while Teodor Atanasov added 16. Nikola Silađi finished the game with 12 points and 13 rebounds. Nenad Nerandžić, with 25 points, was the best scorer in Metalac. Besides points he had 11 rebounds (5 in offence). His teammate Mladen Pavlović, with 22 points and 16 rebounds, was the best player on the court (index rating 39), while Josip Mikulić finished the game with 19 points and 7 rebounds. Two more players had 10 or more points for the home team: Filip Zekavičić (13) and Bojan Krstović (10). After they lost against Partizan in the round before this one, Dynamic also lost against another participant of the ABA league: FMP. The final result was 70 – 82. As it was the case in the game against the Black and Whites, again Miroslav Nikolić’s squad fought well, especially in the third quarter, but didn’t manage to celebrate in front of their own spectators. Stefan Pot had an excellent role in his team win. The young guard scored 21 points with 8 assists. Dragan Apić added 16; Boriša Simanić, 15; Marko Jeremić, 12; and Nemanja Nenadić, 11. For Dynamic, Nemanja Krstić score 17; Petar Rakićević, one point less but with 7 assists; and Andreja Stevanović had 11 points.